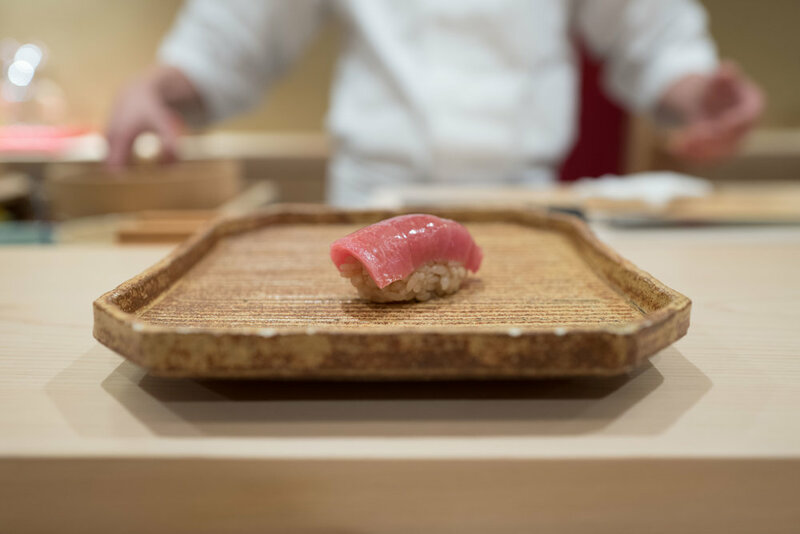 Sushi Suzuki is a relatively new shop in Tokyo, having opened in June of 2015. It is located on the 5th floor of the Nogakudo building, a five minute walk west of Ginza station. The shop features a private room for four and a beautiful counter that sits ten. Chef Takao Suzuki is the man in charge. He's a young chef, but has plenty of experience, having spent 12 years at the famous Sushi Aoki. Suzuki-san is not just a skilled chef, though, he's also a very friendly one who loves to interact with his customers. I had lunch there last month with a friend. We visited on a national holiday, so only one lunch option was on offer: a 13 piece omakase (which also included a couple small otsumami) priced at ¥10,800. On normal weekdays, nigiri lunch sets are available at ¥5,000 and ¥8,000. I don't know what would be served for those sets, but high-priced items like o-toro from Aomori and Hokkaido uni were served during our ¥10,800 meal. Lunch at Sushi Suzuki is a terrific value. 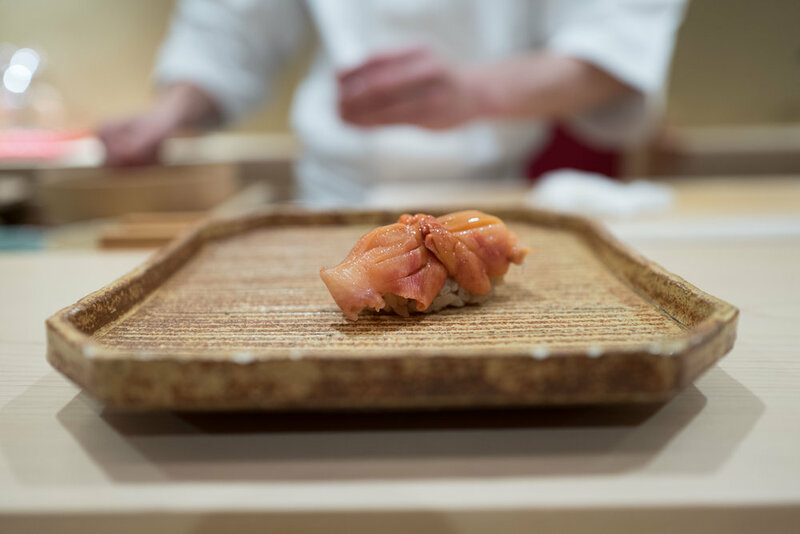 Suzuki's nigiri is fairly classic and straightforward in style: the pieces are proportioned well and the amount of shari to tane is balanced, resulting in well-constructed nigiri. The shari preparation is very good. Both akazu (sake lees vinegar) and komezu (rice vinegar) are blended to create a sushi-meshi that is quite balanced, with good sourness but also a little sweetness from the akazu shining through. The rice, as you can see in the photos below, is slightly brown in color (much like Sato-san's rice over at Tokami) due to the use of akazu. The highlight for me was a fantastic piece of sayori (pictured below) - but all pieces ranged from good to excellent. The shop was not busy when we went, we were the only two customers for the first half of the meal, joined by two others later. (My Japanese dining companion recognized the lady who sat next to me as a famous actress. I had no idea.) This is a fairly new sushiya, so it is currently easy to get a reservation, but the chef is talented and I'm sure it will become hard to book in time. For now, I really recommend it for those looking for "last minute" high end sushi in Ginza. I would imagine that a good hotel concierge would be able to get a reservation here with only a few days notice - maybe even same day on some occasions. While it might not be up there (yet) with the very best available in Tokyo, chef Suzuki's sushi is excellent and priced very reasonably. I greatly enjoyed my lunch here and look forward to returning on a future trip. Below are a few photos of some of my favorite pieces that were served, along with some additional comments. Meguro zuke. The piece of nigiri is placed so that a left-handed person can easily grab it. Suzuki-san noticed that I was left handed before serving the first piece to me. Very attentive chef! Amazing chu-toro. All 3 pieces of maguro served during this lunch came from tuna from Aomori. O-toro. Suzuki-san's shari paired well with the three pieces of tuna. Very nice kohada. Notice the brownish tint of the rice from the akazu. The huge serving of sayori was my favorite piece. We requested a second order of it at the end of the meal. Fantastic akagai - it had a good crunch to it and was very sweet. Tender and sweet sumiika with a touch of Okinawa sea salt. Kurumaebi - always one of my favorites. This big specimen was sliced in half & served as 2 pieces. Very good anago with nitsume.